While some critters find success in living alone, you can count rats out of that group. Rats are naturally highly social and gregarious rodents. They're happiest when they're around fellow rats, and as a result shouldn't live by themselves. Living solo can be stressful on the little guys. Rats in nature live together in sizable groups made up of their kin. This lifestyle is healthy and normal to them. Because of that, pet rats should follow similar living arrangements. Rats appreciate being around others. They find it enriching for many reasons, whether they pertain to playing, mutual grooming or even resting together. 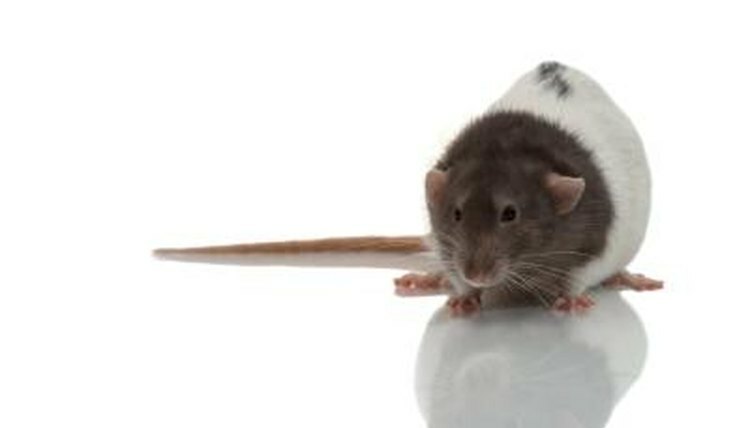 Rats with roommates aren't less pleasant toward humans than rats without them. They maintain their same jovial attitudes toward humans, but only if they're socialized well in the first place. Humans can't ever be suitable replacements for other rats, however. Even if you give your pet plenty of attention, it's still important that he receives valuable rat-to-rat interplay, as well. Ensure that your pet rat is content and well-adjusted by giving him one rat friend -- at the minimum. If your pet rat used to live with another rat who just recently passed away, it might help to bring a new individual in. Loneliness is a big problem for rats who are housed independently. If your rat is youthful, there's a good chance he'll be OK with a new buddy. If he's on the older and wiser side, however, an energetic and youthful newbie might not be the most suitable match. Be extremely cautious in acquainting new rats to each other. When they first encounter each other, make sure they're on impartial turf -- outside of the first resident's enclosure. Carefully observe new rat roommates for violent behavior. If rats can't get along, they should be split up. Although some initial status-related squabbling is common, it typically subsides in a matter of days. Do not be random in selecting buddies for your pet rat. Make sure to only house him with individuals of the same gender. If you don't, you might be dealing with litters of tiny pups in the near future -- pups who will soon need dependable human caretakers and homes. Females should only live with females, and males should only live with males. Rats - Cool Pets! ; Alvin Silverstein et al.